Processes are now streamlined and efficient and Cord Sets is reaping the benefits, including: 500 saved hours annually on work orders, five reactivated accounts valued at $500,000, and the addition of a new manufacturing facility without the addition of office or production management staff. Cord Sets, Inc. has built a solid reputation with its customers as a manufacturer of quality power supply cords. Highly skilled personnel, state-of-art equipment, rigid quality control procedures, and four decades of experience assure Cord Sets’ customers of Zero-Reject delivery. Cord Sets meets demands for both high-volume and short-run production with fast turnaround scheduling. After moving into a 30,000 square foot warehouse and production space in 1997, and establishing a manufacturing facility on a five-acre campus located in Shenzhen City, China in 2000; the company was positioned to grow, and grow it did. Production facilities produced in excess of 6,000,000 power supply cords in the past year. Cord Sets was running an old computer system and missing out on the improvements and better business practices that were available in newer versions. Additionally, the old software company was sold, and the new company would no longer support their accounting software. BASM implemented an upgrade to Sage Pro and provided unique solutions to streamline inventory control and pricing, work orders, purchasing, shipping, sales analysis, commission reporting and more. For years, Cord Sets worked on an older version of SBT’s accounting system. According to Scott Campbell of Cord Sets, they chose not to upgrade the software over the years as newer versions were released. “We worked comfortably for a decade without upgrading,” Scott recalls. “We never felt the need, as the system was functional; however, looking back, the company had certainly outgrown it.” Unknowingly, the capabilities to improve, streamline, and increase the productivity of their business were out there; however, no one was looking for them. Sage eventually acquired SBT and Cord Sets was informed that their antiquated system would no longer be supported. Upgrading to the newest version, now called Sage Pro, was no longer optional. 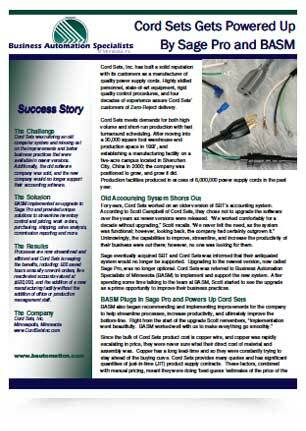 Cord Sets was referred to Business Automation Specialists of Minnesota (BASM) to implement and support the new system. After spending some time talking to the team at BASM, Scott started to see the upgrade as a prime opportunity to improve their business practices. Since the bulk of Cord Sets product cost is copper wire, and copper was rapidly escalating in price, they were never sure what their direct cost of material and assembly was. Copper has a long lead-time and so they were constantly trying to stay ahead of the buying curve. Cord Sets provides many quotes and has significant quantities of just-in-time (JIT) product supply contracts. These factors, combined with manual pricing, meant they were doing ‘best-guess ‘estimates of the price of the product. With correct pricing in advance nearly impossible, Cord Sets absorbed the cost overruns. BASM implemented a Work Order and Purchasing system that helped them get real time pricing to alleviate this problem. This also enabled Cord Sets to eliminate their spreadsheet based inventory system. BASM was also able to provide improvements to shipping. Since Cord Sets’ shipping department handled quality assurance and final production counts, BASM combined the processes to minimize labor and errors. They also implemented a shipping system that automatically captured freight costs and enabled them to get products out quicker for significant savings in cost and shipping time. Additionally, BASM streamlined Cord Sets’ commission reporting system that also eliminated a great deal of printing and filing. BASM provided a report that better met the needs of their salespeople while reducing the amount of labor it took to manage the process. During the time of the implementation, Cord Sets also established their manufacturing facility in China for a new retail product line. Even with facilities handling JIT production on a semi-fixed schedule, and build to forecast for the retail product, BASM was able to help Cord Sets maintain the same office and production management staff while their business volume more than doubled.